You could almost call Last Dance in Kabul by Ken Czech a historical romance. From the first two chapters and the introduction of the male protagonist and the spunky female heroine, I could feel that romance would be a big part of this story. But if you called it a historical romance, a lot of readers like me might miss reading it for fear that there might be too much romance and not enough history or story. That is not true. The attention to detail, and the attention to the realities of war, exotic lands and exotic cultures is superb. If I’m any judge of books, then Ken Czech has a potential bestseller here. The writing is great. It reminded me of a book I read some time ago by Ken Follett. If you have never heard the name Ken Czech, don’t let that deter you from buying this book. It is worth the money. It is professionally done, and this is a name that readers will come to look for in bookstores everywhere. Honestly, I liked everything about Last Dance in Kabul. The writing is outstanding. The plot is great, and the story is superb. But a book can have all those things in place and still be unsatisfactory if the characters are not compelling. You won’t find two more compelling characters than Reeve Waterton and Sarah Kane. I loved them. I rooted for them to survive and work things out from the third chapter until the exciting conclusion. Their story was so expertly woven between survival and romance that I found it difficult to pull myself away from it. Ken Czech really knows how to blend action and romance. Last Dance in Kabul by Ken Czech is a historical novel with strong elements of romance and thriller. Reeve Waterton has made up his mind never to return to Kabul after his bosses ignore his warnings about an impending Afghan upheaval. The ex-military man would have loved to retire into civilian life, but when he rescues the fiancée of his worst enemy, Sarah Kane, from an ambush, things change for him. Reeves quickly learns that Sarah isn’t one to follow orders; she is stubborn and strong-willed and, above all, she detests him. When Reeve’s closest friend gets brutally murdered, he has to make a desperate choice. In this gritty tale, readers will understand the subtle ways of the human heart and how adversity experienced together can create a bond between two hearts — even those that loathe each other. But can Reeve and Sarah work together? The reader will be surprised to find out the twists in this story. In a story set against the backdrop of the British occupation of Afghanistan, the reader is thrust into a world where crises are frequent and where tribes rise against the foreign authorities. The author did a wonderful job in capturing the different seasons of life in Kabul and what the harsh weather feels like. The pacing is great and the writing reads fluidly, containing powerful and vivid descriptions that leave clear images in the mind of the reader. Ken Czech has created two memorable characters in Reeve and Sarah and the reader will quickly be interested in following the tension that brews between these two, curious to find out what happens. Character development is impeccable and the conflict gives the story its powerful depth and emotional intensity. Last Dance in Kabul is a captivating, well-plotted and beautifully paced novel. 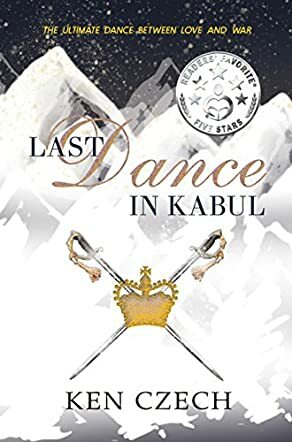 In Last Dance in Kabul by Ken Czech, a hero to some, a villain to others, Reeve Waterton is the main character who plays many roles as an ex-British Army captain. Reeve tries to warn of the upcoming revolt by the Afghan tribes, but no one will listen to him. Sarah Kane is the hate/like/love female lead. She, accompanied by her sister, Connie, has come to marry her long time fiance, Llewellyn Rigby, who is serving in the British Army. Reeve and Rigby have been rivals for a very long time, which only adds spice to the story. Reeve and Sarah's relationship goes through several stages as they fight to stay alive. The climax happens in the heart of the winter with the cold, blizzard tpe weather at its worst, when it becomes necessary to retreat and leave Kabul. As thousands try to make their way across the mountains, they are viciously attacked, while frozen, hungry and tired. Reeve’s only goal at this point is to try to keep Sarah safe, which becomes almost impossible. Last Dance in Kabul is a war story; a story of life and death; a story of love and hate, and it is a very good read. I was pulled back to 1841 and dropped in the middle of the Afghan insurrection. There is excitement throughout this dangerous time, making for a very exhilarating and thrilling adventure. Last Dance in Kabul is a fictional account with some truth sprinkled in. Ken Czech did a fantastic job of making it feel very real and the characters extremely believable. At times I thought it might even be about the present day Afghanistan and not really taking place in the 1840s. I highly recommend Last Dance in Kabul to all readers as it has elements for fans of all genres.